Becky Lynch is one of the most popular Superstars in WWE at the moment, and the way WWE is booking her is only leading to further fan support for the 'Irish Lasskicker'. Despite winning the Women's Royal Rumble match, Becky Lynch's WWE RAW Women's Title match was taken away from her by Mr. McMahon. On top of that, she was suspended until after WWE WrestleMania 35. Now there seems to be a development in Becky Lynch's status for WWE. Becky Lynch was suspended by Mr. McMahon despite Triple H and Stephanie McMahon clearing her for her match against Ronda Rousey at WrestleMania 35. However, that did not seem to be something that 'The Man' was willing to let lie. Instead, she continued to attack Ronda Rousey and Charlotte Flair on the shows, to make sure that no one thought she was okay with being left out of the title picture. 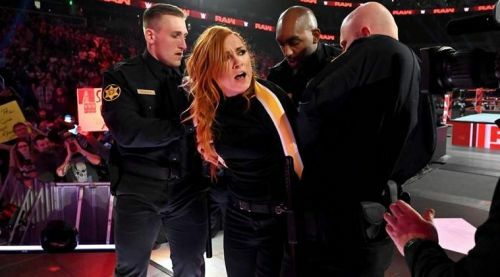 Things came to a head when Becky Lynch was arrested when she attacked Natalya during WWE RAW. She was taken away, while Ronda Rousey, frustrated with the way things were happening, laid her RAW Women's Championship at Stephanie McMahon's feet, demanding that they reinstate Becky Lynch. Stephanie McMahon made her way out to the ring to talk about Becky Lynch and the condition of the RAW Women's Championship. During her announcement, she had a lot of good news for the fans of Becky Lynch. She announced that WWE was dropping all charges against Becky Lynch. Not only that, but her suspension was also at an end. The 60-day suspension was lifted, meaning she was cleared to compete in WWE. As a result of her suspension being lifted, Becky Lynch has been cleared to compete in WWE. Her first match has also been announced, with it being for the title match if she agrees with WWE's condition that they are not to blame her condition if she were to compete at WWE Fastlane.